1972 S Eisenhower Dollar 40% Silver Commemorative. 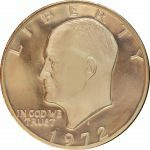 This coin comes in clear hard plastic case and card stock outer brown package. Some coins may exhibit “toning”.